The decision to buy crypto with retirement funds is a great way to capture tax-deferred or tax-free growth. Though Bitcoin was once considered an investment relegated to computer geeks, it’s becoming more mainstream than ever. In fact, many legacy financial companies have jumped on the crypto bandwagon including Fidelity, Microsoft, Morgan Stanley, and even Harvard. Cryptocurrency is an emerging asset class. It is highly volatile and high risk. It’s not uncommon for the crypto market to experience plummeting prices, or even years-long bear markets. So why do investors keep hanging on and putting money into this young asset? Many investors choose to put a portion of their portfolio into crypto because it is uncorrelated. This means that when the stock market goes down, crypto prices are not necessarily affected. This makes crypto a good asset to consider adding to your portfolio, both for risk diversification and even for lowering your overall risk portfolio. Cryptocurrency investors have the opportunity to experience asymmetric risk reward, which essentially means risking a little to potentially gain a lot. Think of the investors who started buying when Bitcoin was a dollar…even through tumultuous ups and downs, they are still way ahead and profitable in their long-term investment. With a Solo 401k, you can grow your assets tax-deferred, or even tax-free (Roth). 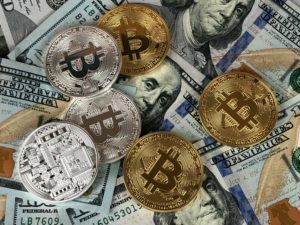 This makes investing in crypto with retirement funds incredibly attractive! Most retirement plans won’t allow you to buy crypto in your retirement account. Fortunately, with the Solo 401k by Nabers Group you have total freedom and flexibility to invest your way. Open Custodial Account: Our team will prepare the custodial agreements for your Solo 401k. All you need to do is confirm the information and sign. Transfer funds: The Nabers Group team will help you fund your crypto custody account. Simply transfer your desired amount from your Solo 401k bank or brokerage account into your crypto custody account. Buy Crypto: Put together an order allocation in line with your goals. Our trade desk will take care of the purchase order and secure storage of your crypto assets. The security team uses a multi-signature offline “cold storage” wallet for the highest security of your assets. Kingdom Trust is the Qualified Custodian for your custody account. They will safeguard your crypto assets, and are well-respected in the retirement account industry. Kingdom Trust was the first IRA custodian to support digital currencies in a retirement account. They currently have over $12 billion in assets under custody. BitGo provides multi-signature storage of your crypto holdings. BitGo and Kingdom hold your assets in secure offline “cold storage” wallets. The cold storage vault is offline and not connected to the Internet. This helps prevent hacking attempts. BitGo will keep your account holdings secure and have a reputation as a world leader in security, compliance, and custodial solutions for blockchain-based currencies. The crypto custody account makes a lot of sense if you plan to buy and hold crypto for a longer investment time horizon. We do not recommend this account for trading. The crypto custody account is also great if you don’t want to deal with the challenges of opening an institutional exchange account and managing custody and security of your crypto assets personally. Click here to learn more about whether this solution may be right for you. The second path to holding crypto in the Solo 401k is to self-custody the assets. This means the 401k trust opens a crypto exchange account and buys, holds, or trades the assets directly. This path requires you to open an institutional exchange account for the Solo 401k trust. You cannot use a pre-existing personal account. Additionally, you are responsible for the safety and security of your crypto assets. Generally, we recommend cold storage offline using a hardware wallet. Open an institutional exchange account: Also known as a business or corporate account. Coinbase currently does not support trust accounts. Generally, Bittrex, Kraken and Gemini are favorable for institutional accounts. The account must be titled in the name of the 401k trust, using the 401k trust tax ID number. Buy Crypto: Once the institutional exchange account is opened in the name of the 401k trust, you are ready to buy crypto. Wire funds from the 401k bank account to the crypto account and start purchasing. Store Crypto: We do not recommend you leave crypto on the exchanges as they can be subject to theft or hacking. Most crypto investors recommend an offline cold storage hardware wallet, such as the Trezor or Ledger. This is an appropriate account to use if you plan to trade your crypto holdings or want to be in charge of your own private keys. Please note the security concerns are far greater with this type of account as you will be using self-custody for the assets. The truth is, it depends! If you plan to trade crypto in short time windows and feel comfortable dealing with opening an institutional level exchange account, as well as overcoming the tech hurdles of a hardware wallet, the self-custody path may be right for you. If you plan to buy and hold crypto for a longer period of time, and don’t want to worry about losing your assets to the threat of hacking or theft, the custodial account may be right for you. Contact a Nabers Group team member if you have any questions and we’ll be happy to discuss your options with you!